Do your young people need encouragement? This study on Moses and Joseph demonstrates how God is with us, even in the worst situations! "Since Jesus Christ is the same yesterday and today and forever" (Hebrews 13:8), He has the same answers for us as He did for Bible heroes. 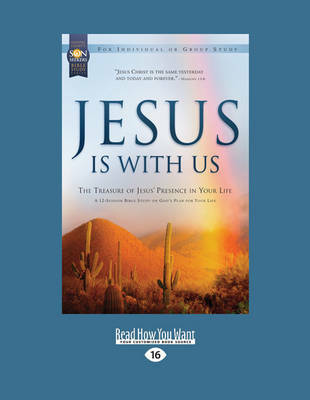 Jesus Is with Me is a Bible study guide for youth - group leaders and teens highlighting the major themes of Bible passages. A companion to Gospel Light's five - session SonWest Roundup VBS Program for children, it can also be used as a stand - alone 12 - week Bible study. Background commentary, small - group guides, a leader's guide, reproducible handouts and more help point to Jesus in every Bible passage."